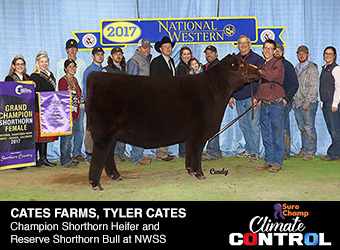 Nick Gardner manages three showboxes in his livestock barn in Washington, Pennsylvania. He’s shown pigs, sheep, goats and cattle since he was 7 years old, and he depends on certain products and equipment for each species. His sheep and goats, his two favorite species to show, share a showbox. 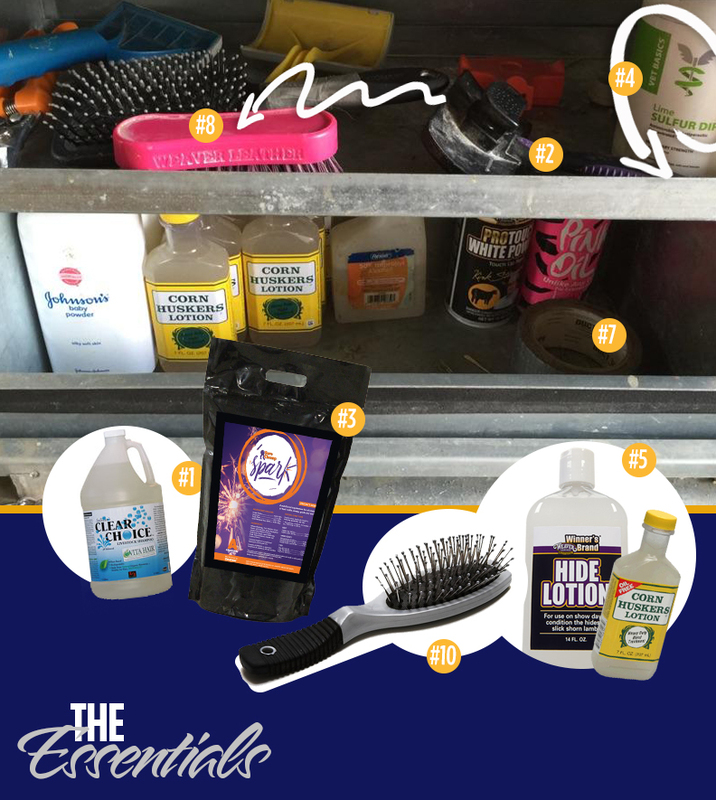 Here are a few of the products he keeps in his sheep and goat box that help him make animals show-day ready. 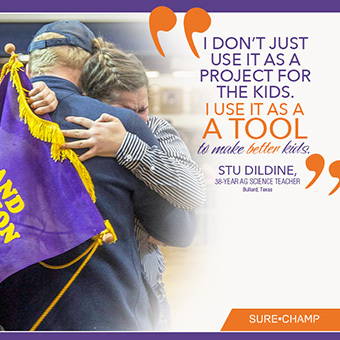 Gardner is loyal to Sullivan’s Clear Choice Shampoo. He says it cleans and smells the best and though he’s tried several brands, Clear Choice remains his favorite. Gardner prefers it for his lambs and goats over a purple shampoo that can stain his stark white goats. Weaver’s self-cleaning slicker brushes are a must have for Gardner. He says they never clog and always work the best on his sheep. “We feed Sure Champ to the sheep and the pigs and we’ve never had one go off feed since we started using it,” Gardner says. Gardner doesn’t leave home without sulphureted lime dip. He keeps it in a sprayer and after he finishes showing he washes his sheep and goats then applies the dip to prevent fungus and sore mouth. He says he’s never had a problem with fungus and attributes it to using this product. The conditioner he likes best for is Weaver’s Hide Lotion. He also uses a cornhusker’s lotion when he’s out of the Weaver product. Gardner says these products keeps sheep and goat skin hydrated and in particular on his sheep, the hide lotion prevents wrinkling. “Once sheep get dried out their skin will wrinkle and look bad,” he says. Weaver Pro-Charge is also a must-have conditioner for his goats. He likes the oil content and his application routine is to rinse his goat’s bodies and legs, blow them out and comb the Pro-Charge in. He does not use it on sheep. Gardner has a couple of items that are always in his showbox – but they gather dust. One is duct tape and the other is a yellow 25-foot extension cord. Gardner is sentimental about a couple of items. He says a friend, Jamie Beatty, won a pink brush at a sheep show and gave it to him. It’s become a running joke between the two, and he’s never taken it out of the box. He also has a goat show collar that was given to him by a friend. He’s used this collar routinely for the past five years and says there is no chance he would change it out for another, newer one. Gardner’s dad, Bill is in charge of bringing the tool box to shows. Gardner also brings pen cards and ink pens to write down random information. 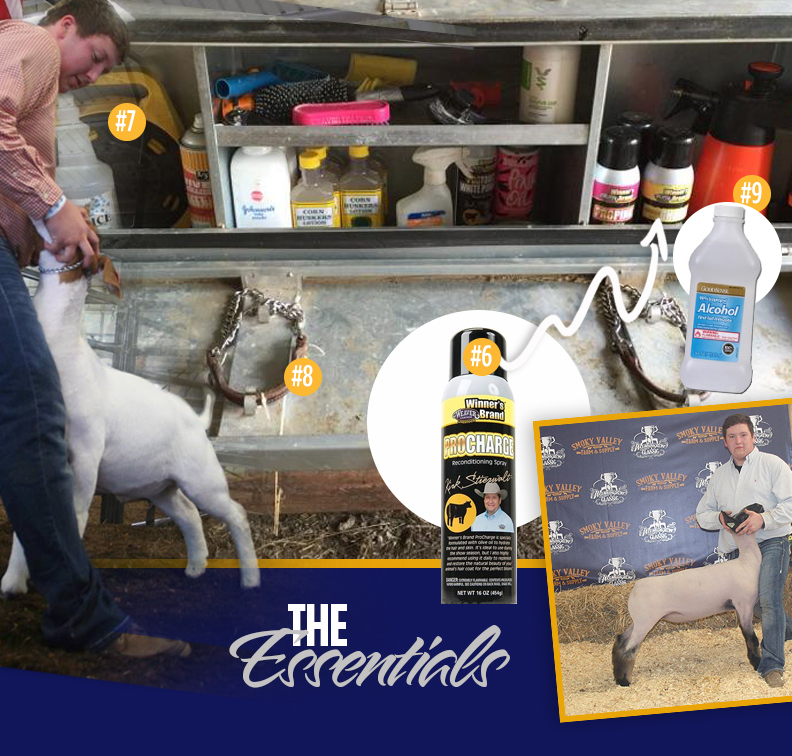 Another must have for sheep and goats is a small bottle of alcoh He puts it in a spray bottle and will use it to disinfect tack before he leaves a show and also sprays a little on his animal’s face then wipes them down to keep the animal cool. The last thing Gardner admits to keeping in his show box is a hair brush – not for sheep and goats but for himself. “That way I don’t look dumb in the ring,” he says with a laugh.